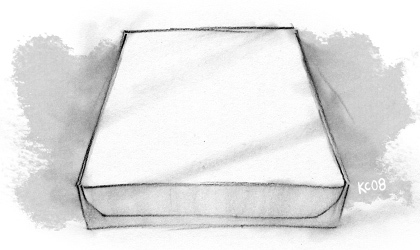 "Building A Better Box Top" - A classic Bearskinrug Article. Throughout my life, I have pursued a lot of pizza. And consequently, I have spent a great deal of time studying the tops of pizza boxes, usually in the first trance-like minute or so of gorging. Recently I found myself contemplating the curiosities of a particular box top, when I realized that the vast majority of them seem to be designed according to a small set of unspoken principles. Let me demonstrate. Here we have a simple, unadorned box. The first step towards turning this into a pizza box seems to be the addition of a cook. 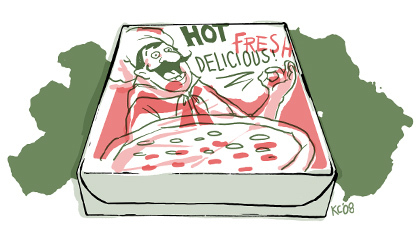 ...and he should be touting some of the chief virtues of this pizza. These are, in my opinion, the essential ingredients of the Pizza Box. Having observed these rules, I couldn't help but wonder what makes this such an effective selling tool — what does this classic scene communicate to the consumer? 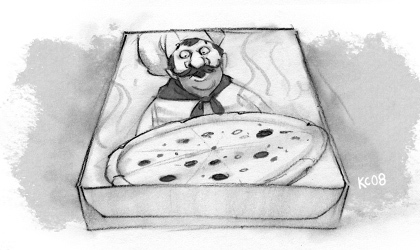 Apparently, pizza purchasers find appeal in the suggestion that their pizza was prepared by an authentic Italian chef. Also, they seem to appreciate advance warning of what a pizza looks like, I suppose so they're not too surprised when they open the box. And lastly, they seem to take great comfort in the reassurance that the pizza has recently been in an oven, and will have a pleasant taste. This formula obviously has worked for years. And yet, I can't help but wonder how it could be improved upon. In this modern advertising era, we recognize that not all consumers are created equal, and what appeals to one, doesn't always appeal to another. You need to target specific demographic groups, and send a message specifically tailored to make them open their wallets. It really offers increased flexibility in pizza topping. Consumers will be much more willing to try something exotic-looking when they're absolutely sure it's meant to be on the pizza. Their pizza might not be refreshing, but their frankness sure is. This should increase tips by 4, maybe 5 percent. But it will probably reduce lonely-housewife seduction ratios. If Fatal Attraction taught us anything, it's that stalker behavior tends to squeeze all the romance out of an extra-marital affair. 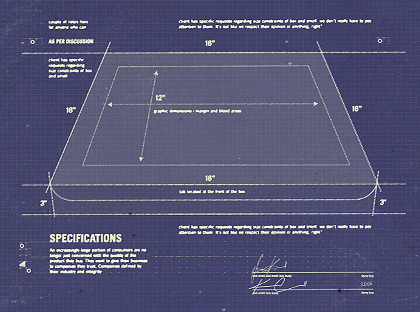 So there you go... just a few examples to get you thinking about the unexplored territory of pizza box design. There are, of course, numerous other groups I didn't even get to speak towards, but that will have to wait for another day. 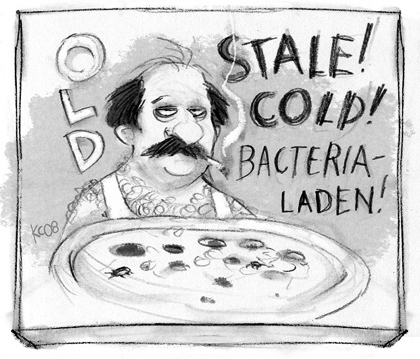 All this pizza drawing has me craving a slice of hot, fresh, delicious, non-urine/filth/pest-topped, legitimate pizza. There are currently 29 comments. I... am... SO offended. And hungry. Offended as a designer, or offended as an Italian-American? Haha, this is much too funny to read at 1.15 am. My sides hurt. Can you make this a series? OK, maybe not a whole series, but I think the world deserves to see your Chinese take-out container rendition (with the requisite off-register version, too). Or the lifestyle section of any newspaper. 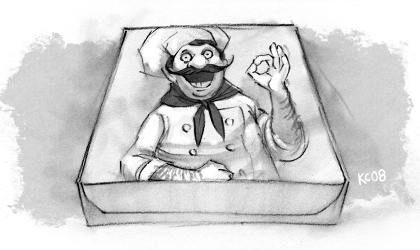 I feel as though I should open a pizza parlor just so I can commission a box-top from you, sir. Nevermind that I do not know the first thing about pizza parlory, I will reassure my customers with the "Clean" box top. Pasquale - You need to take it easy that late... no comedy. Only drama and tragedy. Testmonkey - Chinese take-out containers don't have messages though! Although... I guess what you're saying is they NEED some. Ten-four, testmonkey! Mark Wunsch - I am fully prepared to license it out to you. And I'll throw in a depiction of your employees passing STD tests as well. amazing.... I laughed out loud in my apartment at least 3 times! Thank you! oh man, you really have a sense of taking up the great, but rarely discussed, mysteries of the world. Like the off-register colors, that is so spot-on! Makes me wonder if it has to do with some international agreement between the many pizza-box-motive-print people of the world, or if maybe all pizza boxes come from the same place. I live in Denmark, but I SWEAR I've eaten from a pizza box in Madrid, identical to the ones that I know so well from just around the corner back home. Another thing. On the honest box, I'm not sure the cook should be Italian either, even if it comes from an 'Italian pizzeria'. Chances are minimum that the pizza inside the box has got anything to do with anything more exotic than the canned pineapple on top..
My favorite post of yours ever. The off-register and exterminate boxen are exceptional. Another fine article! For some reason, my local purveyor of Turkish food has started putting their pides in pizza boxes. The off-register picture of pizza might not be the best option given there’s no actual pizza inside. One of the best ever. I laughed so hard I cried. Nocoins - Your apartment needs laughter, too. I don't know why you let all those undead sublet. 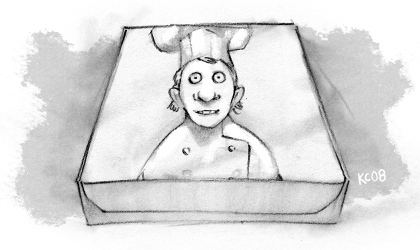 Mikkel - Well, the cook is Italian on the honest box because that's "honestly" what our stereotypical Italian chef would look like. Though I am from Philadelphia, so a large percentage of pizzaria's are operated by men who look like that. Or teenagers. Cliener - They need a pizza box with a window. Or connect the dots. Matty - SCORE! You didn't even cry that time when I ran over your foot with my car! Wow, this is great. However you forgot the much appreciated pepperoni-stained version that i allways seem to end up with. 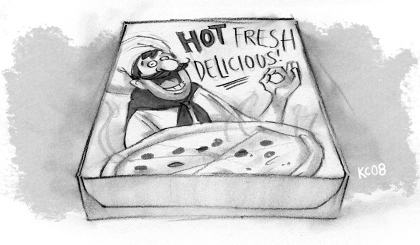 I find it a nice teaser for what awaits you inside... (even though its never pepperoni for some reason). Yep, it's been confirmed by multiple sources... this is my new all-time favorite bearskinrug post. By the way, what about the leaning tower of Pisa? Doesn't it deserve a little space on the stereotype? It really doesn't matter what's on the box. 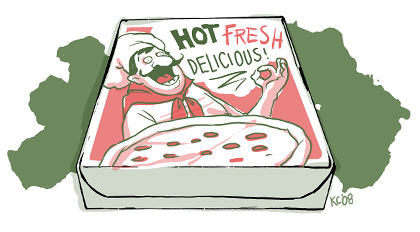 Unless you got to a familiar and reputable joint for your pizza, opening the lid is always an opportunity for surprise/dismay/fear. many little things make me lose sleep in this world and off register printing is near the top of the list. ever go to "The Pizza Box" in glenside kev? some of those guys in there scare me..they need that "not a mafia front!" box. I think this sort of thinking should be applied to other foodstuff containers. I think I'd be more prone to eat donuts that come with a cop on the box. 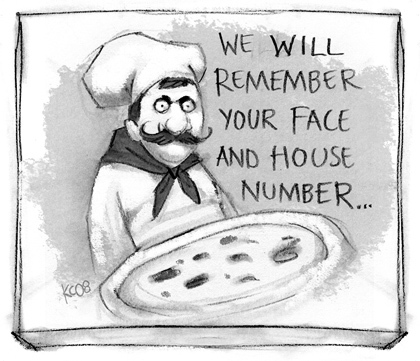 I used to work at a pizza place when I was a teen and I can tell you, the delivery guys *always* remember you, your house number and your order ... especially if you didn't tip. "30 Minutes or Less "only applies to people who do not stir the wrath of the drivers. See, that's why I always overtip. I give the pizza guy $30, sometimes $40 extra dollars. Sometimes he just shows up with other people's pizzas. I love this post, definitely my favorite. The off-register thing makes me lose sleep, i even though i was the only one that was bothered by it! You're awesome. The observation itself is already genius, but the illustrations make it truly hilarious. Thanks for the laughs! Oh man, too funny. I worked at a pizza shop from high school into college (and maybe a bit beyond that) and every pizza box followed this style. 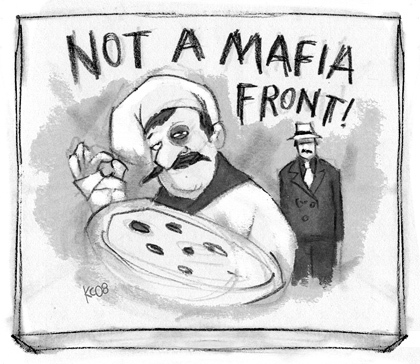 Your rendering of the Italian pizza man looks just like my old boss "Joe" or Giuseppe. Ha ha!!! Giuseppe is pretty much the perfect name for this guy. This made me just about fall off the couch AND wet myself simultaneously. I particularly appreciate the "Uh...yeah... how'd I get here?" 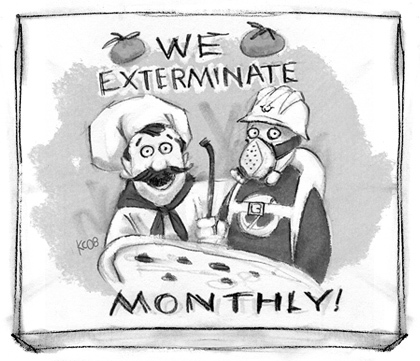 sideways glance on the exterminator's face; that ended me. I rarely read any of the blogs that I follow. I want pictures. Only. But THIS, this is something more! I love to read your words and with theese stunning pictures to follow it, makes this blog absolutely perfect. According to me.